Immunity and inflammation are key elements of the pathobiology of stroke, a devastating illness second only to cardiac ischemia as a cause of death worldwide. While the immune system participates in the brain damage produced by ischemia, the damaged brain, in turn, exerts a powerful immunosuppressive effect that promotes fatal intercurrent infections and threatens the survival of stroke patients. Inflammatory signaling is instrumental in all stages of the ischemic cascade, from the early damaging events triggered by arterial occlusion, to the late regenerative processes underlying post-ischemic tissue repair. Recent developments have revealed that stroke, like multiple sclerosis, engages both innate and adaptive immunity. But, unlike multiple sclerosis, adaptive immunity triggered by newly exposed brain antigens does not have an impact on the acute phase of the damage. Nevertheless, modulation of adaptive immunity exerts a remarkable protective effect on the ischemic brain and offers the prospect of new stroke therapies. However, immunomodulation is not devoid of deleterious side effects, and gaining a better understanding of the reciprocal interaction between the immune system and the ischemic brain is essential to harness the full therapeutic potential of the immunology of stroke. 1,026 experimental treatments in acute stroke. Preclinical evaluation of neuroprotectants fostered high expectations of clinical efficacy. When not matched, the question arises whether experiments are poor indicators of clinical outcome or whether the best drugs were not taken forward to clinical trial. Therefore, we endeavored to contrast experimental efficacy and scope of testing of drugs used clinically and those tested only experimentally. We identified neuroprotectants and reports of experimental efficacy via a systematic search. Controlled in vivo and in vitro experiments using functional or histological end points were selected for analysis. Relationships between outcome, drug mechanism, scope of testing, and clinical trial status were assessed statistically. There was no evidence that drugs used clinically (114 drugs) were more effective experimentally than those tested only in animal models (912 drugs), for example, improvement in focal models averaged 31.3 +/- 16.7% versus 24.4 +/- 32.9%, p > 0.05, respectively. Scope of testing using Stroke Therapy Academic Industry Roundtable (STAIR) criteria was highly variable, and no relationship was found between mechanism and efficacy. The results question whether the most efficacious drugs are being selected for stroke clinical trials. This may partially explain the slow progress in developing treatments. Greater rigor in the conduct, reporting, and analysis of animal data will improve the transition of scientific advances from bench to bedside. Ischemic stroke leads to significant morbidity and mortality in the Western world. Early reperfusion strategies remain the treatment of choice but can initiate and augment an inflammatory response causing secondary brain damage. The understanding of postischemic inflammation is very limited. The objectives of this study were to define the temporal and spatial infiltration of immune cell populations and their activation patterns in a murine cerebral ischemia-reperfusion injury model. Transient middle cerebral artery occlusion was induced for 1 hour followed by 12-hour to 7-day reperfusion in C57/BL6 mice. Immunohistochemistry and flow cytometry were used to quantify the infiltrating immune cell subsets. 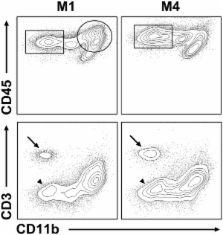 Accumulation of microglia and infiltration of the ischemic hemisphere by macrophages, lymphocytes, and dendritic cells (DCs) preceded the neutrophilic influx. DCs were found to increase 20-fold and constituted a substantial proportion of infiltrating cells. DCs exhibited a significant upregulation of major histocompatibility complex II and major histocompatibility complex II high-expressing DCs were found 100 times more abundant than in sham conditions. Upregulation of the costimulatory molecule CD80 was observed in DCs and microglial cells but did not further increase in major histocompatibility complex II high-expressing DCs. No lymphocyte activation was observed. Additionally, regulatory immune cells (natural killer T-cells, CD4(-)/CD8(-)T lymphocytes) cumulated in the ischemic hemisphere. This study provides a detailed analysis of the temporal dynamics of immune cell accumulation in a rodent stroke model. The peculiar activation pattern and massive increase of antigen-presenting cells in temporal conjunction with regulatory cells might provide additional insight into poststroke immune regulation. Copyright statement: Copyright ©2012 Möller et al. ; licensee BioMed Central Ltd.
MRI of ischemic stroke in canines: applications for monitoring intraarterial thrombolysis.